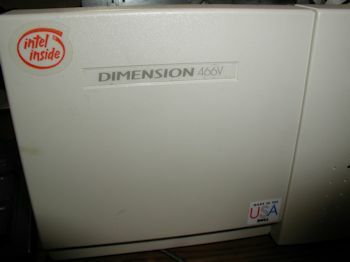 The 1993 Dell Dimension XPS 466V was one of the nicer 486 gaming machines built before the Pentium era. Click for larger view. 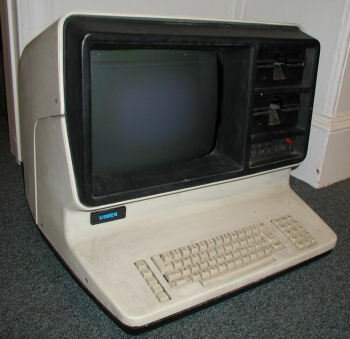 This computer needs a real time clock battery (CMOS). Currently one has to run Setup for each cold boot. 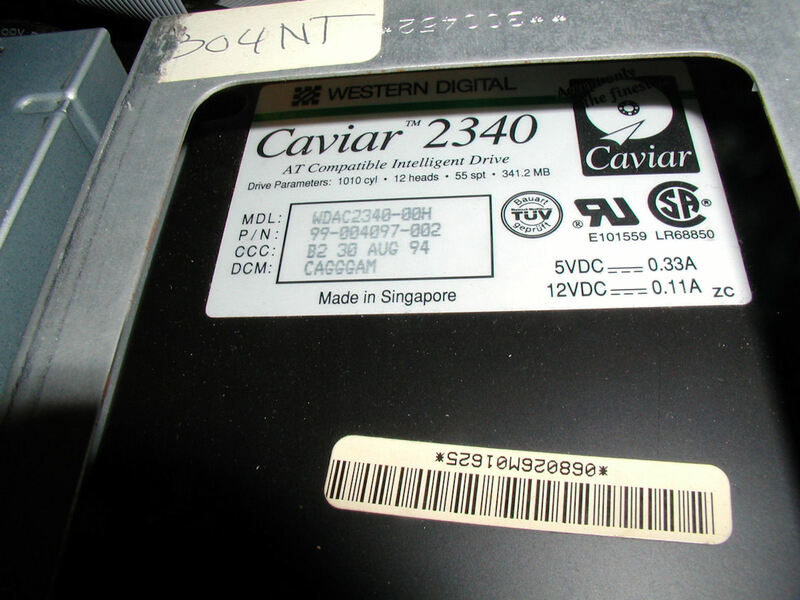 This system has two Caviar model 2340 341 Mb hard drives. 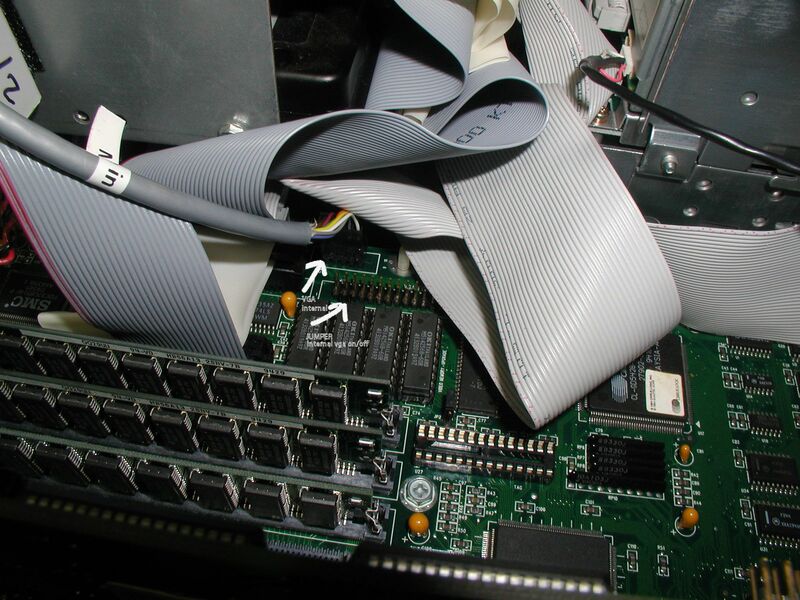 I installed a 1.2Mb 5 1/4" disk drive for utility purposes and I may add a CD ROM in the remaining open slot below the 1.44Mb 3.5 inch disk dive in the middle bay. 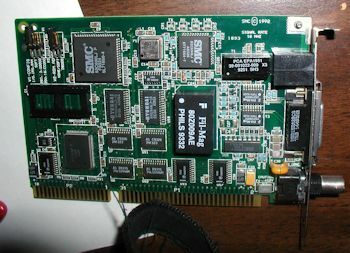 Pictured here is the rear view of the Number Nine Computer Corporation GXE VL Video card. If I remember correctly my testing revealed the best performance is found with a display capable of 1980 x 1080 60hz. Click for larger view. 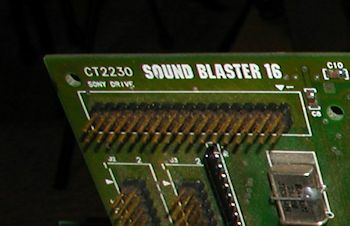 The IDE Sound Blaster 16 Model CT2230 16 bit sound card. Click for view of entire card. 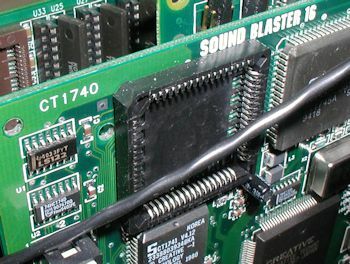 Rear ports showing connection from soundcard to external speaker, video card, etc. I installed the JYEN jumper to activate the joy stick (I did not know this was necessary), but now when I go into Windows the display resolution is wrong, the system is unusable. Interesting conflict. Trying to find a solution or I will do without the joystick I guess. "..NOTE: Some sound cards and video adapters do not report all of the resources they are using to Windows. This can cause Device Manager to show only one device in conflict, or no conflicts at all. This can be verified by disabling the sound card, or by using the standard VGA video driver to see if the conflict is resolved. Note that this is a known problem with S3 video adapters and 16-bit Sound Blaster sound cards, or those sound cards that are using Sound Blaster emulation for Sound Blaster compatibility. 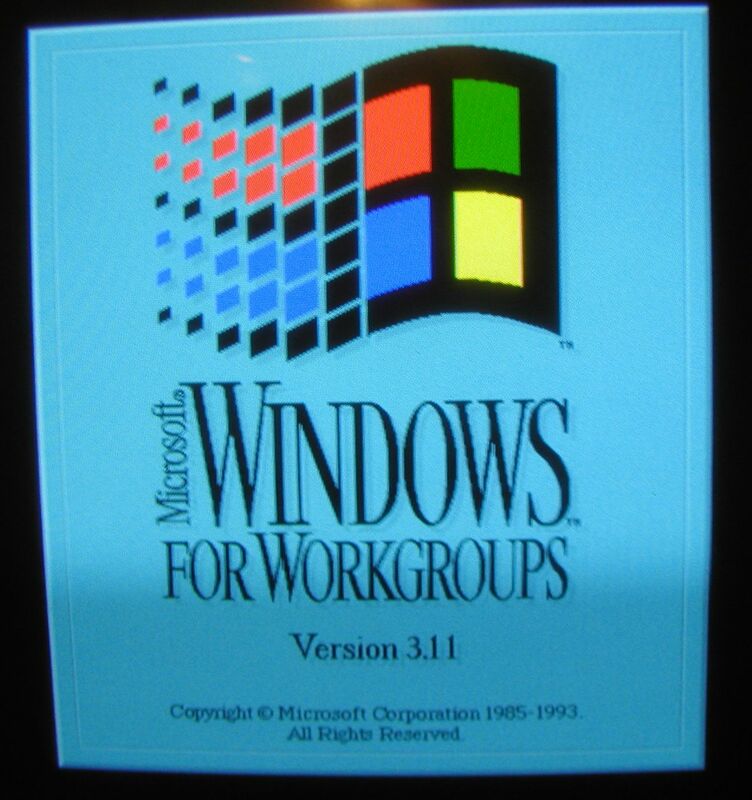 .."
I formatted the C drive (left the D drive as is) and installed DOS 6.22 and Windows for Workgroups (Win 3.11). I also installed the MS Intellipoint Mouse software and the Sound Blaster 16 drivers. Now the system works perfectly, the video is better too. Huh. Glad I stuck with it. Windows version 3.11 / Windows for Worksgroups Splash Screen. 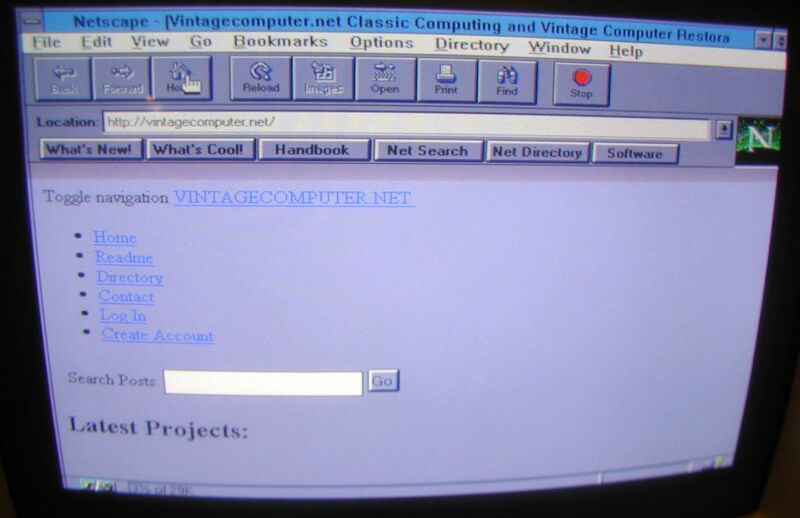 This version of Windows was what most people had at the dawn of the WWW era, it was a networking extension of Windows 3.1. Click image for larger view. I replaced the battery so I could save the BIOS and boot without having to set each time. The service tag of my system is 304NT. The only driver from the Dell.com site was a BIOS update from 2000, which I downloaded (link below). 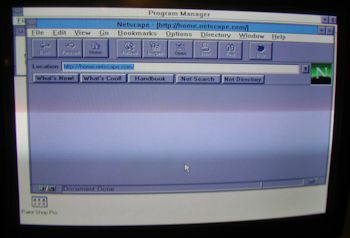 Netscape 3 running on Windows 3.11. I do not have a phone line to actually connect to the Internet, but I can install an ethernet card to connect that way instead. Click for larger view. I found a Windows 3.1 S3 928 card OEM driver that matches the #9 GXE video card. My Dell SVGA display can handle the 64K colors 600 x 480 setting. I installed all drivers for this card, so I can use any display in the future. Modern flat-panel displays look even better. 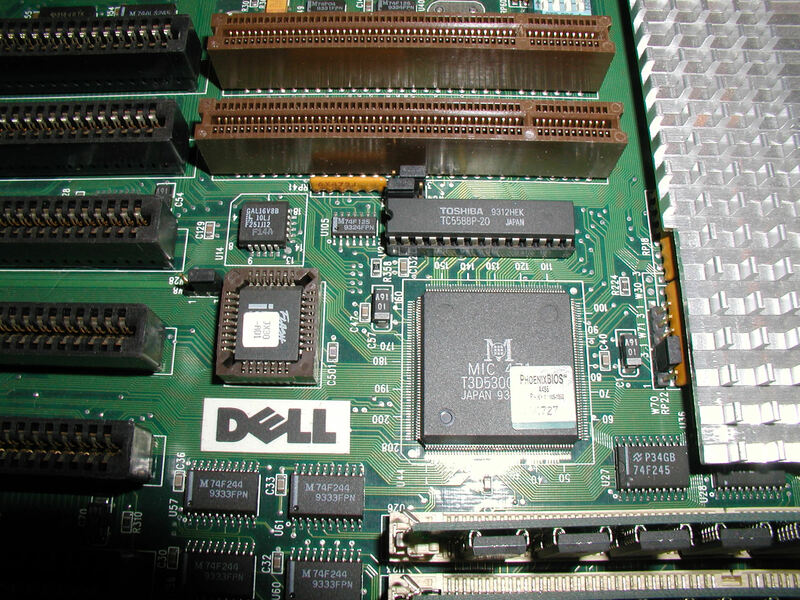 From an OEM standpoint, the GXE is a S3 928 card. ...but there were no matches for Win 3.1, no CD drive. SideWinder products - they want to force you into using Win95. SDWRGMPD will let you use your GamePad in just plain old DOS." I set out to try the driver. I started with the Microsoft Sidewinder, but I found that it works better with the RadioShack gamepad. The RadioShack gamepad may be a clone of the Microsoft Sidewinder Game Pad intended for the SDWRGMPD. If you download the driver you'll find that the author created a utility called THRUSH that you can use to test your joystick. 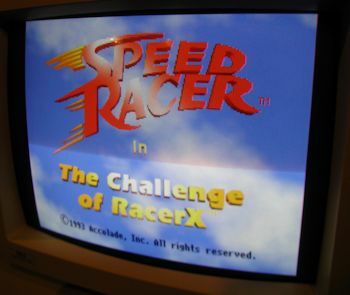 Speed Racer in The Challenge of RacerX. Click image for larger view. The 1992 SMC Elite 16 Ethernet card, known as the 8013 EWC. Click for larger view. There are a few other pictures if you click the link above that leads to all the pictures for this unit. I got the networking program installed to the point that I could enter the TCP/IP info. I used the default settings suggested. I was unable to connect to my home LAN. "Your network adapter MS$W13EW is not working properly. You may need to set it up again. For more information...." "...The following error occurred while loading protocol number 0. Error 58: The network has responded incorrectly. You may need to reconfigure the protocol using Network Setup"
I tried all available IRQ options in the Windows Network Setup program, but none worked. Some I could save (no conflicts), but there was no combination that prevented the above error, nor could I connect to my local LAN. 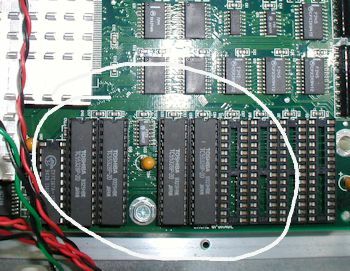 I did not find the manual for the SMC Elite 16 8013 EWC network card, but I was able to locate the EZSTART program that SMC provided from this era and it happened to have the WFWG drivers (and lots of others). I ran the EZSTART program. 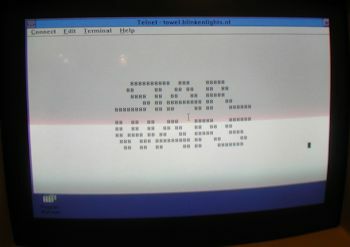 Again, the program could not get the desired response from the card to configure it. Same kinds of errors WFWG was reporting. I opened the PC cover to access the SMC card. I removed the W1 jumper, which was set to SOFT and stuck it on the middle position, (labled 280,3,D0000). No luck, EZSTART did not like it. Next I tried the far right position labeled 300,10,CC000. 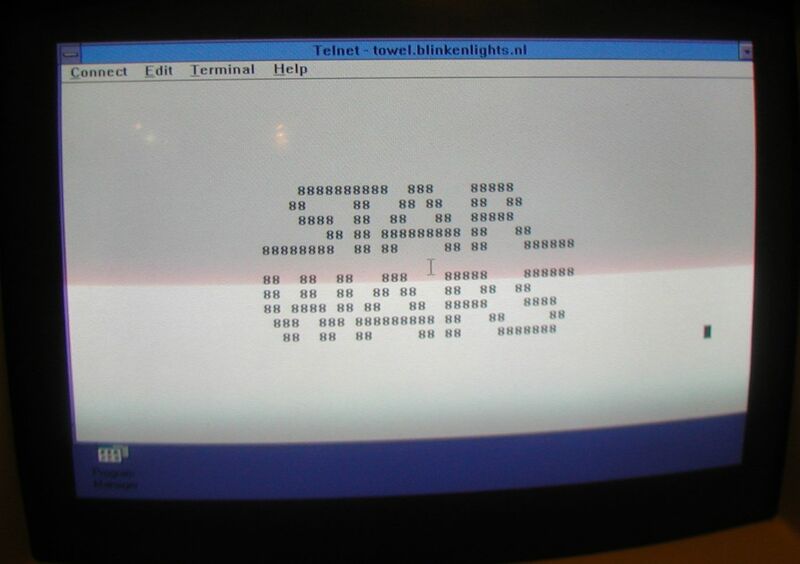 This time the EZSTART program was able to run the card diagnostics. Apparently the default IRC conflicts with another service. 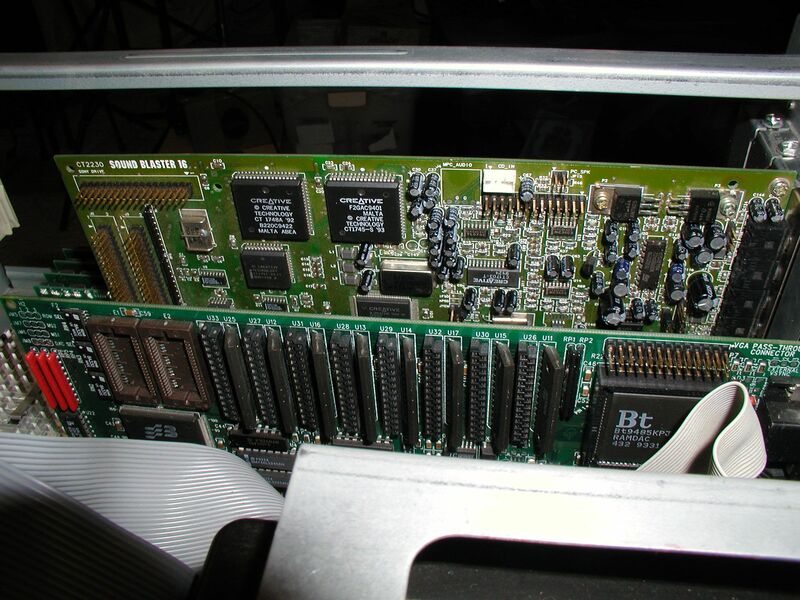 EZSTART diagnostics reported that the Elite 16 card was OK.
Next, I extracted the appropriate drivers for Windows 3.11 supplied by SMC and installed them. EZSTART made the necessary changes to the Windows configuration and set the TPC/IP driver to use 300/10/CC000. 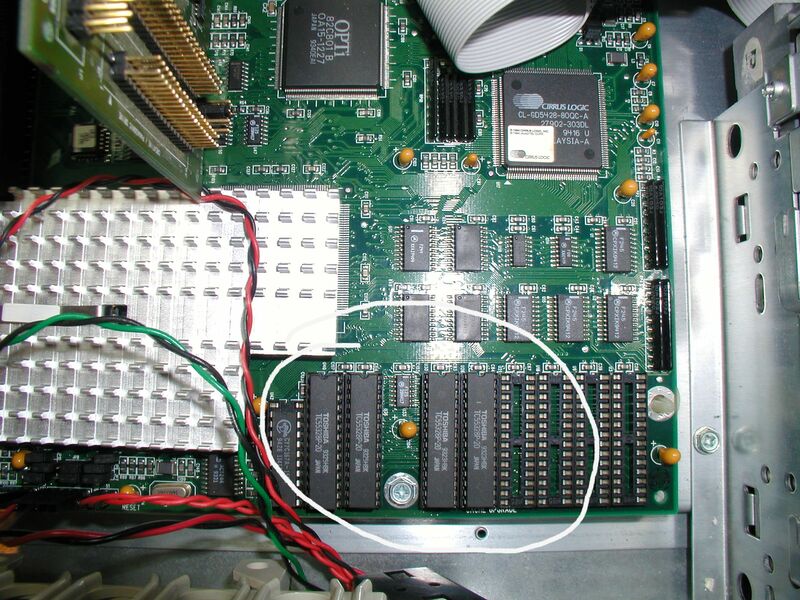 The EZSTART program saved the IRQ values to the SMC Elite 16's onboard ROM and instructed me to put the jumper back to the SOFT position (from far right to far left as it is in the picture now.) and reboot the computer. 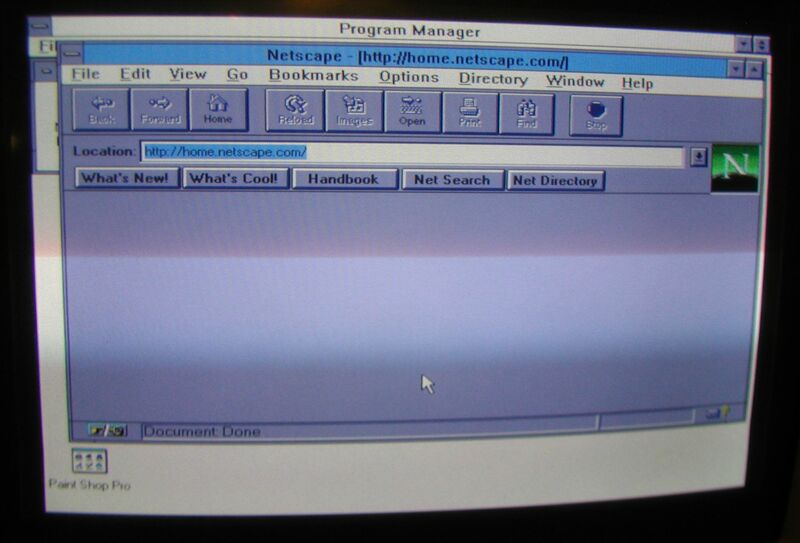 I have a copy of Netscape 2.0 and now I can access web pages on the WWW. 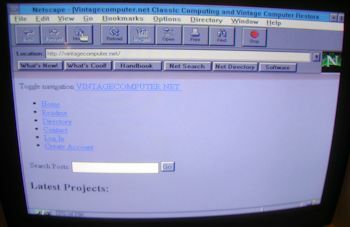 vintagecomputer.net Windows 3.11 style! Works! The motherboard of the XPS referred to above died. I found a "non XPS" version of the Dimension 466V to use as the source of a replacement motherboard. It cane with a 3.5 drive and sound blaster card and a working mother board. The vanilla 466V is not exactly the same as the XPS 466V but with a few changes I was able to upgrade it to an "XPS". Compare with above picture of the front panel label. Click image for larger view. 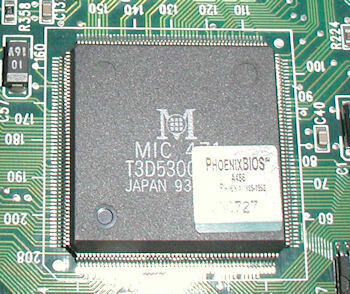 The 466V motherboard has an internal VGA port, which is not present on the XPS version. 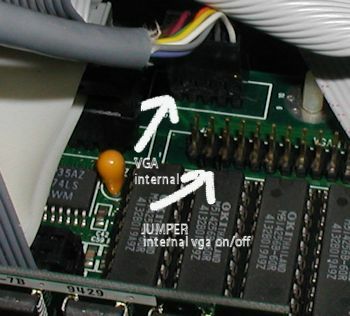 This image shows the internal port and the jumper one has to remove in order to use a video card instead. Click image for larger view. 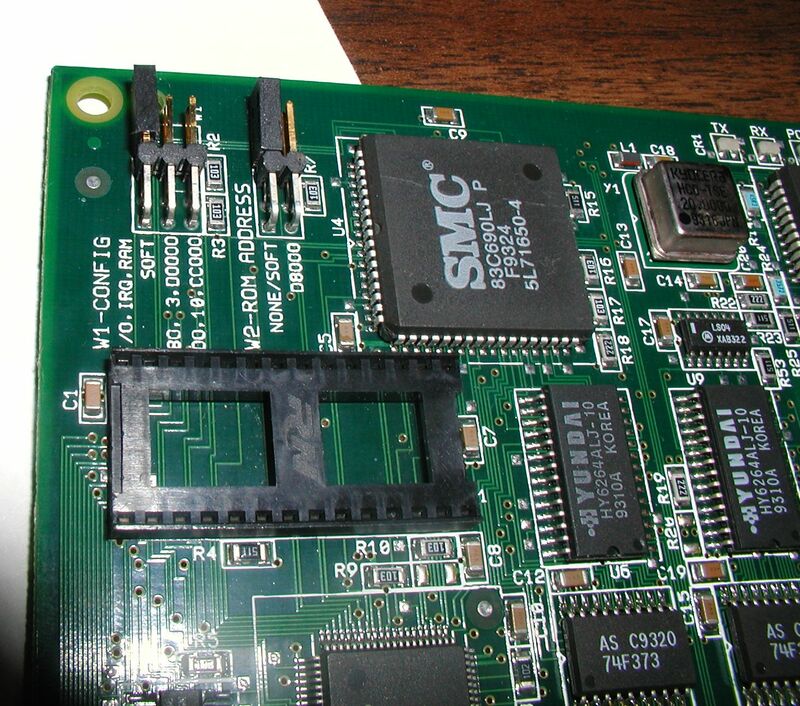 I removed the less-capable Sound Blaster CT1740 because it was missing the CSP/ASP chip (see empty socket in this image). Click image for larger view. I migrated the cache RAM from the XPS motherboard into the open slots of the "non XPS" motherboard. 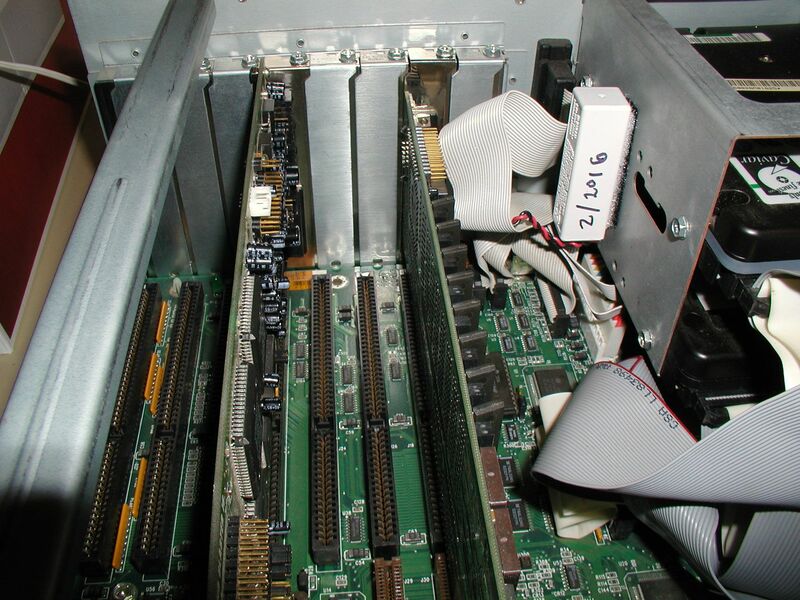 The cache slots are not oriented the same as the XPS, but I guessed correctly where the chips should go. Click image for larger view. System booted, works. While I was there I also added more RAM, so it's actually better now than before the motherboard died. I did not bother to investigate whether than XPS 466V ROMS are any different than the "non XPS" ... I am unsure if XPS just means that it came with a nicer external video card and cache RAM pre-installed or more. As I sid, the motherboards are a litter different. I did not remove the CPU heat synch's on each mobo to check the CPU chips for differences. I am guessing they're the same. If anyone sees this post and has either model just remember their very close but not exactly the same. There is very little online about the 466V's.